Following the Gilpin family tradition of giving to the Friends of the Bowlus, Inc., Karen and Jim donated $3,000 to the plaza project very early on - in late 2015. Last year after their names were drawn as cash price winners for a Rotary organization fundraiser, they directed the not-for-profit to send another $1,000 of their winnings to the Friends. "The plaza project on the east side really looks great and will greatly improve access," Jim said. "I think Mr. Bowlus would be pleased!" 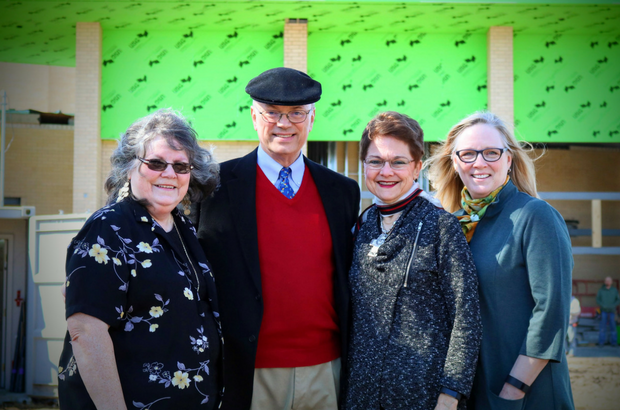 Pictured are Diana Asher, Friends of the Bowlus President, Jim & Karen Gilpin, and Susan Raines, Bowlus Executive Director. Always keeping her eyes and ears open, Friends of the Bowlus Board Member Rita Berntsen stumbled across an opportunity to apply for a donation from the America's Farmers Grow Communities Monsanto Fund - and she jumped on it! (Monsanto is a company that supplies many farm related products including seed and fertilizer that the Berntsens use on their family farm.) 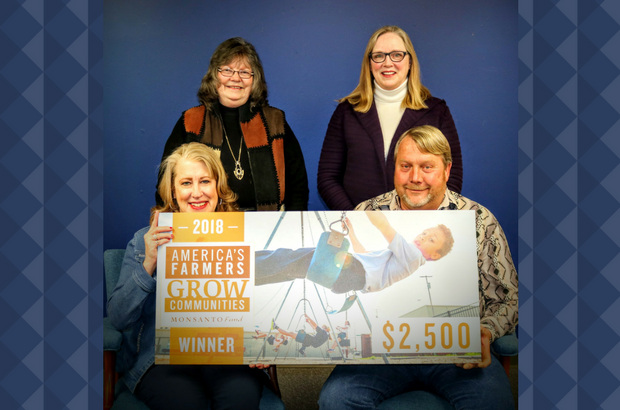 ​​​​ Thanks to Rita and husband Rick, the Bowlus Fine Arts Center has won a $2,500 America's Farmers Grow Communities donation! This donation will be used to help complete the Fine Arts Plaza project. Since 2010 more than $29 million has been donated by America's Farmers Grow Communities, sponsored by the Monsanto Fund. More than 8,000 organizations in rural America have benefited -- and we are PROUD to be one of them! Pictured with the Berntsens are Diana Asher, Friends of the Bowlus President, and Susan Raines, Bowlus Executive Director. In spite of this cold and nasty weather further delaying the progress of the east entry project, the Friends of the Bowlus, Inc. has a lot to be thankful for. Iola's Chapter L, P.E.O. presented Friends of the Bowlus President, Diana Asher, with a check for $1,000.00 to help with remaining project expenses. We are so grateful for your generous gift and your support of the Bowlus! While the Friends have enough in their coffers to finish the building addition, funds are still needed to complete landscaping and other aesthetic features in what has been dubbed the Fine Arts Plaza. This beautiful photo was provided courtesy of the Iola Register. Pictured are front row from left, Stephanie Larson, P.E.O. 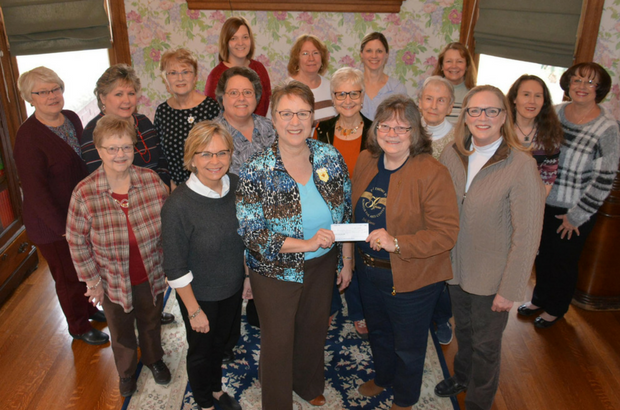 Special Projects Chair, Chapter President Terri Piazza, Friends of the Bowlus President Diana Asher, and Bowlus Executive Director Susan Raines; second row, P.E.O. members Linda Johnson, April Hudson, Judy Baker, Sally Huskey, and Susie McKinnis; third row, Nancy Toland, Shellie Regehr, Mary Ann Arnott, Terri Carlin, Charlene Larson, Beth Toland, Lisa Whitney, and Pam Hart. 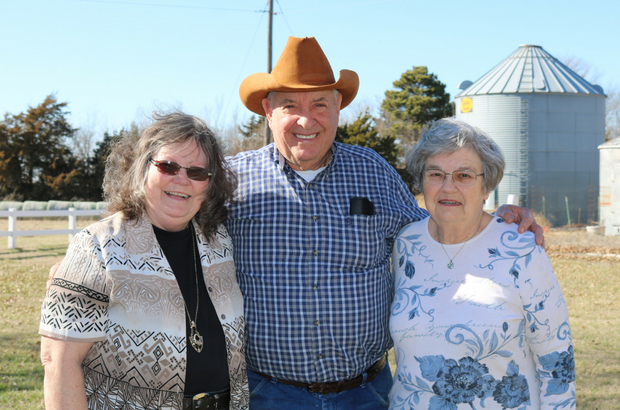 Allen Count farmers Gary and Janice Parker are also no stranger so the Bowlus and Friends organization. Gary has served on the Friends Board since 2008 nad the couple regularly attends Bowlus events. Over the past few years, the Parkers have given "gifts of grain" to several well-deserving charitable groups in our community, and the Friends of the Bowlus is thankful to be among them. With their "gift of grain," a portion of the income from the season's crop is directed to the Allen County Community Foundation, which then disburses the funds to the various recipients as designated by the Parkers. This method of giving reduces the amount of farm income realized, providing a benefit to all parties. The Parkers have also inspired their children to give. Why just last month, the Friends received a generous gift from the Parkers' son Brad and daughter-in-law Dorothy with a note reading, "In honor of Gary Parker's 80th Birthday!" We think that is a VERY THOUGHTFUL gift! !